2018 campaign cash is already flooding into races across the country. But nowhere is more awash in money than Wisconsin, where Tammy Baldwin’s U.S. Senate race has already seen more than twice the amount of the next closest contest. The spending is “unprecedented” for a U.S. Senate campaign at this stage, says Andrew Mayersohn, a researcher for the Center for Responsive Politics. As of April 23, 2018, more than $10 million had been spent by conservative groups buying ads opposing Baldwin or supporting one of her two main Republican rivals, management consultant Kevin Nicholson and longtime ALEC legislator and State Senator Leah Vukmir. In contrast, just over $1 million has been spent supporting Baldwin or attacking her opponents. The PACs and dark money “issue ad” groups trying to unseat Baldwin are connected to some of the most powerful right-wing donors in the country, including Richard Uihlein, Robert Mercer and the billionaire industrialist Koch brothers. These billionaire backers of the far right are working hard to take down Tammy Baldwin, a pro-labor, pro-environment, pro-universal health care progressive. Below, the Center for Media and Democracy details some of the biggest spenders in the race. 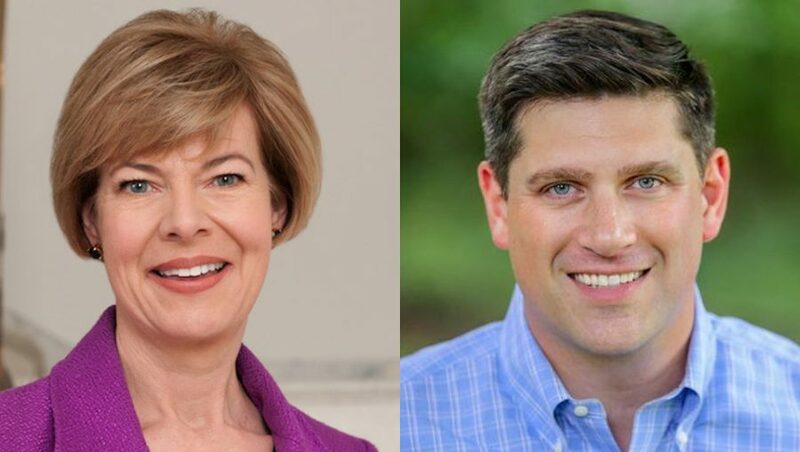 The biggest outside spender in the Wisconsin senate race to date is industrial supply magnate Richard Uihlein, owner of the shipping supply firm Uihlein Corp. Uihlein single-handedly turned little-known veteran Kevin Nicholson into a major threat to Baldwin’s seat. Uihlein’s “Restoration PAC,” a federal Super PAC, has spent $541,374 against Baldwin and $2,502,268 supporting Nicholson. Uihlein has bankrolled Restoration PAC with $4,225,000 as of February 2018. His “America’s PAC” has spent $2,621,565 supporting Nicholson, as well as $703,500 opposing Baldwin. Between September 2017 and February 2018, Uihlein has given America’s PAC $2.65 million. But all that money doesn’t translate into common sense. In an embarrassing gaffe, America’s PAC sent a radio ad to 20 Wisconsin stations favorably comparing Nicholson with embattled Missouri Governor Eric Greitens. Greitens is facing a criminal trial for initiating an affair with his hairdresser by strapping her arms to exercise hoops, blindfolding her, stripping her and taking a photo to make sure that she wouldn’t tell anyone. What do Greitens and Nicholson have in common? Both are veterans and both were Democrats who are now running for office on the Republican line. America’s PAC is attacking Baldwin for the death of several veterans at a Veterans Administration (VA) hospital because she allegedly ignored a whistleblower’s warning about “overmedicated veterans.” Politifact rated this claim “False” and reported that the whistleblower’s warning could not be tied to the three deaths in question. The John Bolton Super PAC, run by the same John Bolton who is now the National Security Advisor of the United States, has spent $560,570 supporting Nicholson. The PAC plans to spend $1 million to help Nicholson defeat Vukmir in the primary. The Super PAC has been largely funded by hedge fund manager Robert Mercer, one of the “blow it all up” billionaire backers behind Trump and one of the first investors in the controversial “psy-ops” organization Cambridge Analytica. Good governance groups Democracy 21 and Citizens for Ethics and Responsibility in Washington (CREW) filed a complaint against the John Bolton Super PAC in March 2018, claiming that the PAC’s work with Cambridge Analytica and SCL Industries violated election laws prohibiting foreign nationals from “directly or indirectly” participating in American political campaigns. The billionaire Koch brothers are the also donating heavily to an array of PACs attacking Baldwin. Concerned Veterans for America (CVA) is a Koch front group based in Arlington, Virginia. CVA purports to be a grassroots group of vets who want to reform the VA. But the phony front group is the only known “veterans” group pushing for the privatization of the of the VA, which provides comprehensive health care services to the nation’s nine million veterans. After being fired via Twitter in March, Trump’s Secretary of Veterans Affairs David Shulkin warned in an op-ed in the New York Times that the VA is entangled in a “brutal power struggle” over privatization. As of March 8, 2018, CVA had spent $3.1 million against Baldwin, including ads on the same false claims made by America’s PAC that she was responsible for deaths at a VA hospital. In addition, CVA’s Executive Director Dan Caldwell flew to Wisconsin to participate as a panelist in the first GOP primary debate between Vukmir and Nicholson. The debate was sponsored by none other than the Kochs’ astroturf organization, Americans for Prosperity. The candidates predictably embraced every Koch policy as they vied for the billionaires’ endorsement and money, but the debate did allow Vukmir to savage Nicholson as a former Democrat. Freedom Partners is the Kochs’ non-profit 501(c)(6) dark money “trade group” funded by the Kochs and staffed with Koch operatives. As of April 28, 2018, Freedom Partners has spent more than $1.6 million on attack ads accusing Baldwin of “rigging the system” by voting for higher taxes (which paid for programs such as the Affordable Care Act). After a seemingly grassroots Tea Party uprising against the 2010 Affordable Care Act, it was later revealed that the Kochs played a major role bankrolling the many right-wing groups involved. When asked about why the Kochs were campaigning against health care, Americans for Prosperity President Tim Phillips told the New York Times that the plan was to discredit the government (or as he put it, the “social welfare boondoggle”) in preparation for the fight over climate change. Stay tuned, this interesting race is likely to get a lot more interesting. Leah Vukmir won the GOP straw poll at the Republican state convention this weekend with 72 percent of the vote. This is after Vukmir began tweeting out photos of Baldwin and Khalid Sheikh Muhammad, the planner of the Sept. 11, 2001 attacks, calling them “Team Terrorist.” The crude move, allegedly protesting Baldwin’s silence on the Gina Haspel CIA nomination, was denounced as an “irresponsible campaign blunder” by far-right news outlets and “embarrassing” by Nicholson. Baldwin had been waiting to meet with Haspel, who had cancelled a scheduled meeting. Maxwell Abbott is an attorney and a contributor at the Center for Media and Democracy. Baldwin is one of the 1st UW graduates sporting the lbgt scholarships. If there are people who believe scholarships should be based on sexual preference then I personally do not want them in political office. Should scholarships be based on race? While Caucasian only scholarships are being discontinued…. we have black only, women’s only, & these lgbt only. All scholarships should be solely based on merit, & all physically or gender based be considered unconstitutional.